The European elites, in the name of profit and competitiveness, destroy social justice, democracy, climate and use Europe as a playing field for their own interests. They blackmail and humiliate those who dare to resist; they rule with fear, nationalism, racist division and claim that there are no alternatives. But we build alternatives through our various and cross-linked struggles. 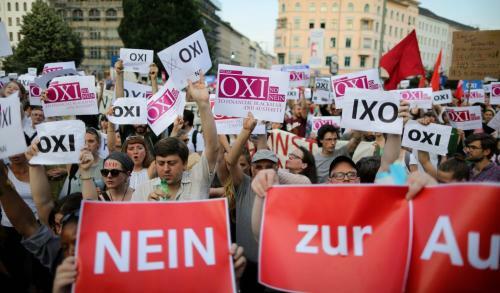 Let’s develop our solidarity beyond borders, our strength in this European-wide Oxi! Basta! Enough! Let’s build another Europe now! Our Oxi! No! is a Yes! to equality, social and labour rights and real democracy ! A Yes! for European debt cuts ! A Yes! to climate justice and to peasant agriculture ! Read more on the OX15 website!